Hey, cool. It looks like it's going to thresh the cloudy sky away. That is an amazing shot. You don't see these around very often! It looks like it's raising its arms to the sky. But figuring out what is in the foreground is going to bug me all day! Wow, looks kinda creepy! Great shot. excellent sky! I sometimes forget that a dark, cloudy sky can add so much to a photo. Wow, that is too cool! Very beautiful in a dark, American Gothic sort of way. Cool! When I was a kid in Oregon, our town had a yearly Threshing Bee. Not many people even know what that is! Great picture, but I have no idea what it is, apparently something to do with threshing. It was enjoyable reading your comments. And those truly are some mennacing skies! Interesting picture. Very sculpturesque (a word?) with the arms reaching up to the sky. Neat but what is it? As Robin says, it looks like a modern sculpture. Fascinating shot, especially with those sinister clouds in the background. This shot is perfect for today, for me it evokes the "arms to ploughs" and visa versa concept. That is really an interesting picture. Not sure what it is ;-) but rather dramatic adn a bit eerie with the gray clouds behind it. Great shot! Look at that sky! Looks ominous. I'd have never guessed what it is. I like that you take pictures of unusual stuff. Things like that draw my attention as well. Very cool! I love the mood of it! They remind me of the clouds here right now! First time I've seen one. Thanks for sharing. 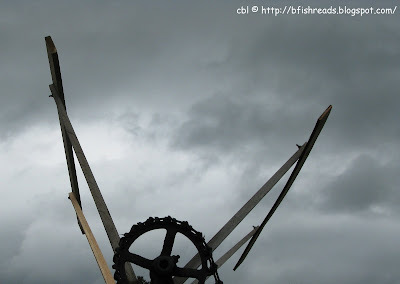 the clouds and the thresher face off ... who will win? Great mood in that shot! !